The potential economic, social and environmental gains from conserving mangroves—90 per cent of which are found in developing countries—still remain largely under-exploited, says a new United Nations (UN) report. The report further estimates the economic cost of the destruction of carbon-rich mangroves, which are being cleared three to five times faster than terrestrial forests, at US $42 billion annually. “Over the last century or so, large areas of coastal wetlands have been lost as a result of human activities. Looking forward, remaining coastal wetlands are under threat from human resource use, physical alteration and destruction, altered sediment supplies, nutrient and freshwater supply and pollution,” says the report. UN under-secretary-general and UNEP executive director Achim Steiner adds, "As the latest Emissions Gap Report makes clear, countries are increasingly aware of how much progress they need to make to limit a global temperature rise to 2° Celsius. Developing countries have a major climate change mitigation and adaptation asset in the form of mangroves because they hold several times more carbon than terrestrial forests." Suggesting ways to harness the economic and social benefits of mangroves, the report suggests that policy interventions and carbon finance mechanisms need to be introduced. Ensuring that mangroves have a place in UN-supported Reducing Emissions from Deforestations and forest Degradation (REDD+) strategies— both national and international—is another need of the hour. According to the report, a number of big and small ongoing projects across the world, in the fields of coastal wetland conservation and restoration, are not only leading to growing knowledge related to coastal management but also promoting adaptation in communities. The Gazi Bay community-led carbon finance project in Kenya for the conservation, management and restoration of 117 hectares of mangroves has so far sold certificates of 3,000 tonnes of carbon dioxide (C02), with funds being allocated to community projects and additional mangrove activities overseen by village leaders. Besides this, the report also talks about setting up field schools that can help to build capacity within village communities who are learning to develop more sustainable livelihoods and adapt to climate change. For this, it cites the example of the community of Kurricaddi in South Sulawesi in Indonesia that has restored 75 per cent of a pond complex after learning techniques from one such school. “Conservation of existing intact coastal wetlands carbon ecosystems is technically the simplest and most effective mechanism to manage carbon stocks, and provides the greatest ecosystem benefits,” adds the report. According to the United Nations, the term mangrove is used both for the tree itself, and the overall habitat. Mangroves are small to medium evergreen trees or shrubs, usually with a complex root system. They grow in the intertidal zone of marine coastal environments and estuarine margins. Mangroves are among the most productive of coastal ecosystems. About 75 per cent of all tropical commercial fish species and associated ecosystems, such as seagrass meadows and coral reefs, depend on mangrove forests as nurseries, and for shelter and food. Additionally, mangroves protect coasts from waves and wind—helping to reduce the risk of flood damage and erosion—and support soil stabilisation, nutrient retention, filtration of sediment and pollutants, and trapping of carbon dioxide. 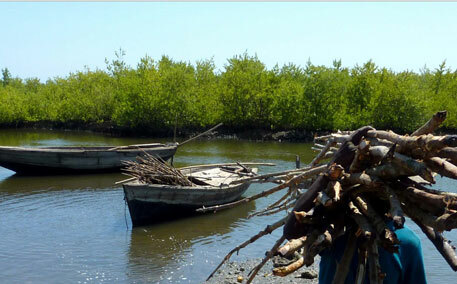 For people living in coastal areas, mangroves provide firewood, medicine, fibres and dyes, food and building material.